3 nights at Curaka Expeditions Lodge and 1 night camping in the thick and lush tropical jungle. All trips are conducted by local guides who know the jungle and its mysteries.They will share their experiences and stories of the Amazonian forest around a campfire. Ecological walks, night excursions, bird watching, piranha fishing. Taste the typical dishes such as juane, cecina con tacacho, paiche, grilled suri, patarashca (fish cooked in leafs) and others. Transfer from the airport or hotel. Short walk around the Plaza de Armas to observe the Main church, the Malecon (Riverside Boulevard) and the old houses from the rubber boon era. Transfer to our dock for a fifteen minute boat ride on the Itaya River, and then join the amazing natural wonder of the world: THE AMAZON River. A short informational presentation about this largest and majestic river. Along the way we’ll look for grey and pink fresh water dolphins. We will travel up the Amazon River until we reach the Curaka Expeditions site. At arrival you’ll be greeted with some local fruit juices of the season and be presented with information about the lodge. General information and assignment of your private quarters. Walk through the jungle to appreciate the great biodiversity, flora and fauna of the area. Afternoon jungle walks to learn about the flora and fauna and the existing biodiversity of the area. Night jungle walks to observe some night jungle life and listen to the sounds emitted by insects, batrachians, night birds and other creatures. Short narrative of jungle stories, myths and legends Amazon narrated by your guide around a camp fire. Bird watching in their habitat either walking or by canoe. Visit to a riverbank village Where we’ll see boa constrictors nonpoisonous) slots, turtles and other animals. Lunch: Typical dish of PATARASHCA, (either fish or meat cooked wrapped in leafs). In the afternoon we visit the riverbank settlement of “GALLITO” where we learn and observe the inhabitants daily activities. Depending on the weather we just luck out and observe one of the most spectacular sunsets in the Amazon. Breakfast fishing on the Amazon for catfish, piranhas and other species. Short trip to Observe the VICTORIA REGIAS, the largest aquatic plants in the world. Afternoon walk of the surroundings learning about plants and fruits utilized and consumed by the local inhabitants. We learn about the “Caucho” or rubber tree, the Amazonian cedar which is a fine quality lumber with multiple uses and much desired, and the giant Ceiba tree. Time indicated readiness to undertake the placement virgin forest. 1.30 hours walk about knowing flora and fauna, make our first stop where food are prepared for lunch. We continue walking up the river Yanayacu, where we will camp and spend the night in our tents and mosquito nets. After dinner night walk knowing the nocturnal wildlife. 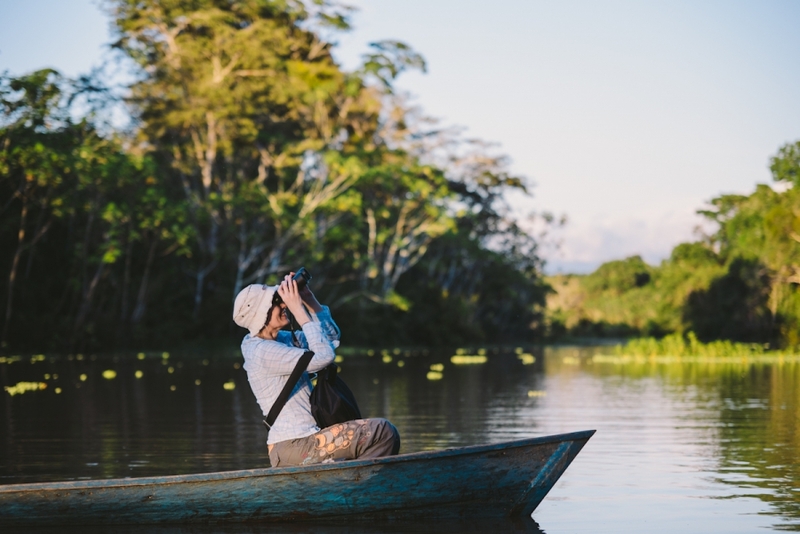 Trip by canoe along the Amazon river bank to observe birds, iguanas and other Habitat of the area. Free morning to observe the surroundings and take some pictures or simply read and relax in the hammock hut. Lunch: typical dish of Cecina con Tacacho (Bacon with mash baked green bananas). Return to Iquitos with a stopover at the Bora tribe where we will learn about their customs, dances, clothing and listen to their dialect. We suggest you bring some items and trinkets to barter for their handcrafts. Arrival in Iquitos and transfer to your hotel or airport. The Loreto region ( the largest in land mass in Peru) which is basically the Peruvian Amazon basin and the city of Iquitos average a temperature of 28 t0 32 degrees Centigrade ( 80 to 84). It is rainy, warm and humid. You should pack light long pants and long sleeve shirts, as well as shorts and short sleeve shirts and t-shirts. hat, sunglasses, tennis shoes, hiking shoes or boots, sun screen, mosquito repellent, a light raincoat, a light umbrella . Some of these thing can be purchased or rented in Iquitos. The rainy season is normally from November to June causing the water levels to rise creating the opportunity to visit BELEN, the floating houses section of the city of Iquitos. Season of less rain and more sun is between July and November when the temperature could rise up to 32 degrees (89 to 90). When you confirm and book your trip please make us aware of any restrictions on your diet, health issues and other concerns that may complicate your trips and prevent you from fully having a good time. In regards to infants and children parents should take all precautionary measures such as having the proper foods and medications necessary for the duration of their trip. Vaccines: If required you can obtain vaccinations 10 days prior to your trip at the National Institute of Health in Lima, located at: 1400 Capac Yupanqui, across from the Edgardo Rebagliatti Hospital. It is your responsibility to care and safely keep personal objects and accessories such as money, jewelry, health IDs, personal IDs, passport and other objects of monetary or sentimental value. We suggest a waist or belt pack to carry some of these items. We are not responsible for the loss of any of your property if you did not declare or store them in our facility with management knowledge. We request that everyone takes into consideration and adheres to all solicited and contracted programs and services. During any and all trips you must listen and respect all guides instructions and indications and at no time you should separate from your guide or wonder about on your own. Do not stay too far behind or take another venue during a excursion. The sequence of any excursion could vary depending on the weather during the day or night. Parents or adults in care of children must at all times keep a watchful eye and be aware of their children’s whereabouts and activities. We request them to be vigilant and keep their full attention for their safety. HAVE A VERY HAPPY JOURNEY ! WE’LL BE WAITING FOR YOU IN IQUITOS !